China and the Russian Federation will be among the key source markets to watch over the next five years. This is one of the key take-aways from the just released ‘Asia Pacific Visitor Forecasts 2017-2021 Full Report’. Following on from the earlier Executive Summary Report, this latest release delves deeper into origin-destination pairs for 39 Asia Pacific destinations as well as providing tourism receipts, income and price elasticities (where data permit). Through 2017 the major international visitor-generating markets will be driven by China in Asia, and the USA and Mexico in the Americas. Greater China – comprising China, Chinese Taipei, Hong Kong SAR and Macao SAR – is expected to generate more than 261 million international arrivals to the 39 Asia Pacific destinations covered in this report, an annual growth rate of 7.9 percent year-on-year and an incremental increase in absolute volume of over 19 million arrivals. While annual percentage growth from Greater China into Asia will expand by a little under the average (7.8%), the destinations of Asia will capture 95 percent of the volume increase between 2016 and 2017 from these origin markets. The Americas will capture around 3.4 percent of that volume increase and the Pacific the remaining 1.6 percent. Arrivals from Europe and Africa will each grow by 3.5 percent in 2017 year-on-year. While Africa is expected to generate just over three million arrivals in total during 2017, Europe will generate around 67.7 million arrivals to the destinations of Asia Pacific in that year. From within the European origin markets the Russian Federation is expected to deliver the largest volume of additional arrivals into Asia Pacific in 2017, adding over 373,000 additional arrivals between 2016 and 2017 and doubling its collective inbound count to almost five million in that latter year. The United Kingdom and Germany, however, remain the principal generators of arrivals from Europe, delivering 14.9 million and 11.3 million arrivals respectively into Asia Pacific in 2017. France will deliver 7.1 million arrivals in 2017, ahead of the Russian Federation. Australia is by far the largest generator of international arrivals from the Pacific into Asia Pacific destinations in 2017, delivering over 12 million arrivals during the course of the year, close to 620,000 more than in 2016. By 2021 it will still be Greater China that generates the largest number international arrivals into Asia Pacific destinations, with mainland China and Hong Kong SAR specifically generating 164.6 million and 131.6 million arrivals into Asia Pacific destinations respectively in that year. They will be followed by the USA and the Republic of Korea which are expected to generate 47.9 million and 29.7 million arrivals respectively. Canada will rank fifth as an origin market, generating 25.4 million arrivals in 2021. 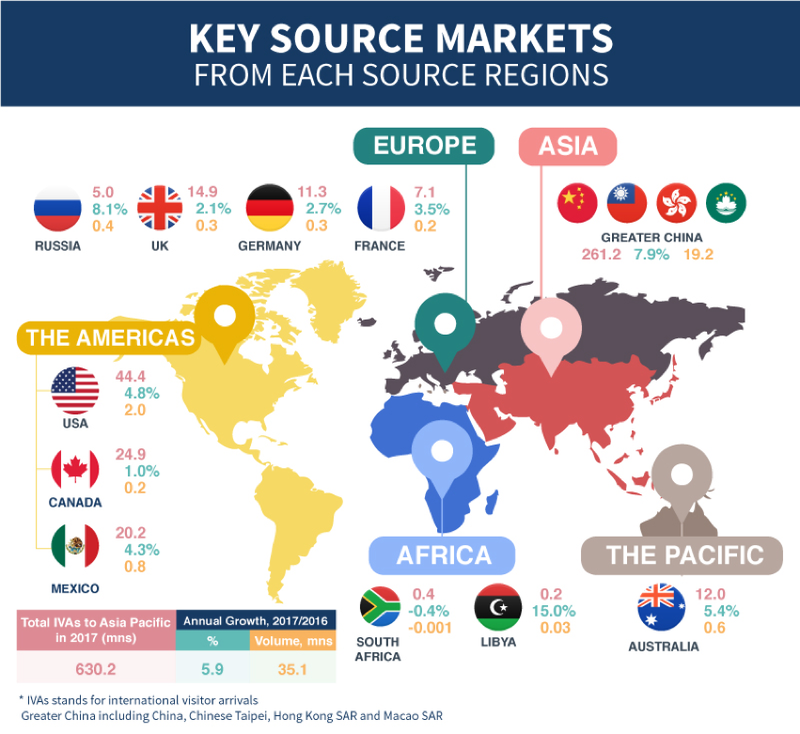 The strongest growth in additional arrivals between 2016 and 2021 will come from – in order of volume increase – China, Hong Kong SAR, Korea (ROK) the USA and the Russian Federation. Together these five origin markets will deliver 383 million international arrivals into Asia Pacific destinations in 2021, an increase of more than 112 million over the volume delivered in 2016. Arrivals from the Americas are expected to expand with an Average Annual Growth Rate (AAGR) of 2.3 percent per annum, between 2016 and 2021, while Europe will grow by 3.1 percent per annum. While these rates are lower than the overall AAGR of five percent, they never the less contribute to a substantial volume of arrivals into Asia Pacific, generating over 116 million and 76 million arrivals respectively in 2021. These lower than average AAGRs however mean that, in relative terms, the share of foreign arrivals from the Americas and Europe will decline from 17.5 percent to 15.0 percent in the case of the Americas and from 11 percent to 10.2 percent in the case of Europe. Asia dominates in terms of generating international arrivals into Asia Pacific in 2021 and the relative share of arrivals from this region will rise from 64.2 percent in 2016 to 67.9 percent by 2021 on the back of an AAGR of 6.1 percent between 2016 and 2021 and an absolute increase volume of arrivals of almost 133 million over that same period. Visitor arrivals are one metric but the revenue these foreign arrivals generate is another and for the 24 destinations for which revenue data are available, it appears that total receipts from international tourism will increase from US$692.4 billion in 2016 to US$729.2 billion in 2017 and up to US$806 billion by 2021. While destinations in the Americas held a 42.4 percent share of tourism receipts from among these 24 destinations, that relative performance will drop marginally to 41.7 percent in 2017 and then fall to 39.1 percent by 2021. Asia, on the other hand, can expect an increase from US$372.7 billion to US$398.7 billion between 2016 and 2017, increasing to US$511.9 billion by 2021. This moves the relative share position of Asia in terms of receipts from international tourism from 53.8 percent in 2016 to 54.7 percent in 2017 and 57.7 percent by 2021.